Greg Lane & Eric Gieger in La Rumorosa photo by E. Harel Copyright © 2005 All rights reserved. "McCaleb’s visually engrossing premiere begged a second viewing, right then, for another dose of well-meshed choreography and highflying theatrics. The seven-part dance-theater work stretched way beyond pretty into an archetypal beauty." Nancy McCaleb hails from New Orleans. She trained with Betty Jones and other veterans of the José Limón Company in NYC and with Carol Soleau, director of Oregon Dance, and Jancy Limpert, Stanford University. She holds an interdisciplinary M.A. in dance, music and the visual arts. Her first professional performances were with Simone Forti in Paris. She founded McCaleb Dance in 1997 after a decade as choreographer, dancer, and artistic director of Isaacs/McCaleb & Dancers. She has received the National Endowment for the Arts Creativity Grant, the California Arts Council Artist Fellowship in the Performing Arts, the James Irvine Foundation DanceMaker Grant, and the USA-Mexico Fund for Culture Grant. In collaboration with KPBS-TV, San Diego, videos of her dances received five national broadcasting awards, including the CINE Golden Eagle and an EMMY. She was honored by the GLADD Award for Excellence in Theater, and by the San Diego Press Club as Headliner of the Year in the Performing Arts. Recent commissions for choreography include the San Diego Museum of Art; Cultural Events UC Riverside; and the Contemporary Museum of Art, San Diego. Eric Geiger joined McCaleb Dance in 1998 and has performed, choreographed, and designed sets and costumes for numerous works. 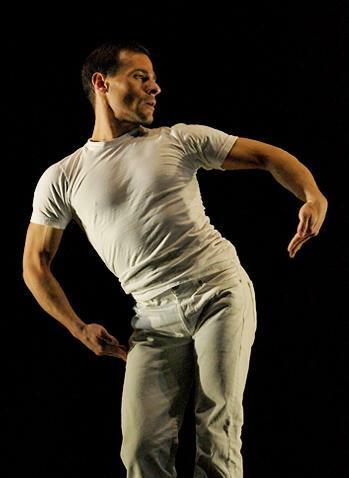 He trained as a merit scholarship student at the Alvin Ailey American Dance Center. He was a company member of the Bill T Jones / Arnie Zane Dance Company in NYC, where he performed, taught company class, set company repertory, and assisted Mr. Jones. He was also a company member of the Lyon Opera Ballet in France, Djazzex Modern Dance in the Netherlands, Joyce Trisler Dance Company in NYC, and V-TOL Dance in London. He, received his B.F.A. from the San Diego Design Institute and his M.A. in Interdisciplinary Studies in Scenic Design and Dance from San Diego State University. Eric is a faculty member of the UCSD Department of Theatre and Dance. photo of Eric Geiger by E. Harel Copyright © 2006 All rights reserved. "Eric Geiger's rich lineage showed in the complexity and intelligence of his untitled work in progress. Yet there was also something that felt individual and new and thrilling – here's an artist with something to say and a unique way to express it."